Thangka is a religious painting done by specially trained religious painters, very often a monk belonging to his order. These painters had to follow strict guidelines of religious painting set forth in treatise and tradition. They rarely condescended to paint furniture as they were trained to paint deities and mandalas, which were the focus for ritual and meditation. This Thangka depicts a group of “yidmas”, personal deities associated with the most well-known form of Tantric Buddhism called Vajrayana Buddhism practiced in Tibet. The practitioner of this form of Buddhism meditates and concentrates on a portrait, a realistic or abstract image or a painting. The divinity’s strength flows into the believer. Through concentration on and union with the divinity in this image, one hopes to attain the formless and expressionless state of nirvana. Depending on the character of the believer, the yidam may be peaceful or fierce. Friendly yidams are usually buddhas. A fierce yidam is nothing but one’s own pent-up, intense ferocity, a rage that is directed against one’s annoying undercurrents that stand in the way of a breakthrough to total understanding. Whenever one clings to pleasure-seeking life too much, the wrathful yidam will appear in its’ fierce, bloodthirsty-like guise. The moment the believer banishes his ego to the background, the yidam will reveal itself in its’ peaceful guise. The glow that one can feel in the process of intense thought, rage, or joy, translates into an aureole of flames in the portrayal of yidams. In general terms, these savage types of yidams protect Buddhism from enemies that threaten the faith of Buddhism. As guardian deities, most yidam-portrayal thangkas have a special place in the monastery close to the holiest part of the complex. 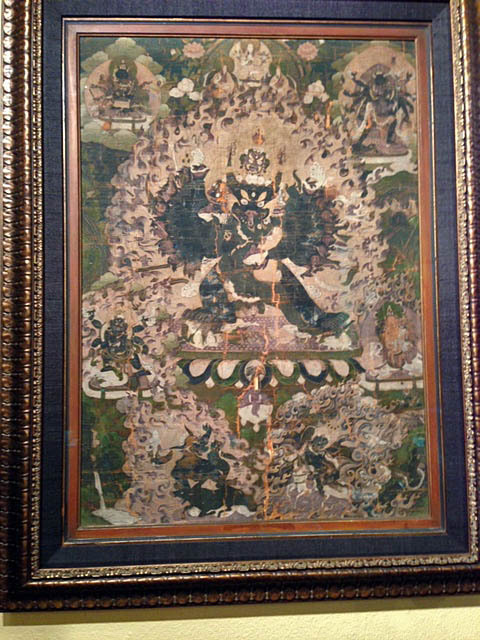 This thangka is over 400 years old. When found, the canvas with painted mineral colors has deteriorated in places showing cracks but valuable in revealing the canvas is done with ramie over a board before mineral colors were applied on top. This is a technique often used in Ming furniture. The “flaw” on the canvas proves the thangka’s antiquity. It is regretful this relic needed reframing as the original family who owned it left it in storage and let the old thin black frame deteriorated to such a point it was falling apart. The painting is reframed with a black silk matting within carefully chosen frame molding with wavy pattern to compliment the subtle movement of the different subjects represented and to coordinate with the muted colors of the mineral pigments on the canvas. We think the result enhances the thangka without ruining it.